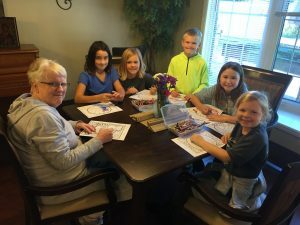 Crystal Springs Assisted Living: Each month an elementary class spends time at Crystal Springs singing and interacting with the residents. The middle school coin drive raised money to help repair a roof above the 5th and 6th grade classrooms. The Elementary coin drive raised more than enough money to pay for Jozel and Kristine’s tuition. And we will incorporate the Filipino culture and writing letters to students into our FARM activities. Kids Food Basket: Dutton Christian supports Kids’ Food Basket through our bake sales, which are held by 3rd-5th grade classes. Once the class counts the money, they will shop for items on their wish list. 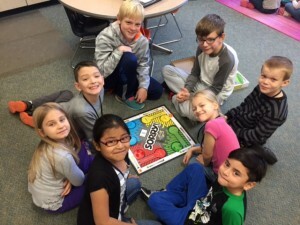 The third graders volunteer there in January to become familiar with KFB and what its mission is all about: helping food insecure children in Grand Rapids. We’ve also support Kids’ Food Basket with our elementary Thanksgiving food drive. We collect items for their break bags, which go home with children over longer school breaks. SAAB is our student council at Dutton. Each quarter of the school year has different students that are on SAAB, and all the 8th graders get a chance to be on it. Give Christmas Away: Our Accountability groups each chose a service project. Student go into the community to show Christ’s love. Examples of Give Christmas Away projects include providing blankets for homeless downtown, reading and playing games with students from disadvantaged schools, buying coats for those in need, and visiting shut-ins. We support Dutton’s Community Food Pantry by going the first Monday of every month to help them set up and get ready for the pantry. We put out various food items on the tables, break up boxes for recycling, or do anything they need done. This is a great way for us to help out the local community. Also we do one service project or drive per quarter. (We do one fun day per quarter, too) This varies on who we support for the service project. Last year we raised money for Family Promise because one of our 8th grader’s mom volunteered there. We served at Meltrotter for a morning as well by working there and we also had a tour. In the past we have raised money for many different organizations like Kids’ Food Basket, Eagle’s Nest Children’s Home, Guiding Light, Dutton’s Food Pantry, Wedgewood etc. Every fall we do a quarter drive. This year we are raising money for our sister school in the Philippines, Grace Christian Community School. We try to support them often. Every Thanksgiving with the Turkey Bowl parade we do a food drive for a local pantry. This is not part of SAAB but every Christmas the middle school does Give Christmas Away where we encourage students to choose something out of the book my Matthew West, 101 Simple and thoughtful ways to give this Christmas away. We also give them this book via a donor. Then anyone who wants to can share what they did during a chapel.